Children love playing in sand at least for a few years. Instead of buying lumber to build a sand box, use your existing rigid plastic kids’ pool as the liner for your sand box. This is a project the kids might even want to help you with, as it only requires a shovel and maybe a pair of scissors to open the sand bags. Bring in the plastic shovels and some plastic ware from the kitchen and your children have a safe play area with no construction necessary. Choose a flat area for building your sandbox. 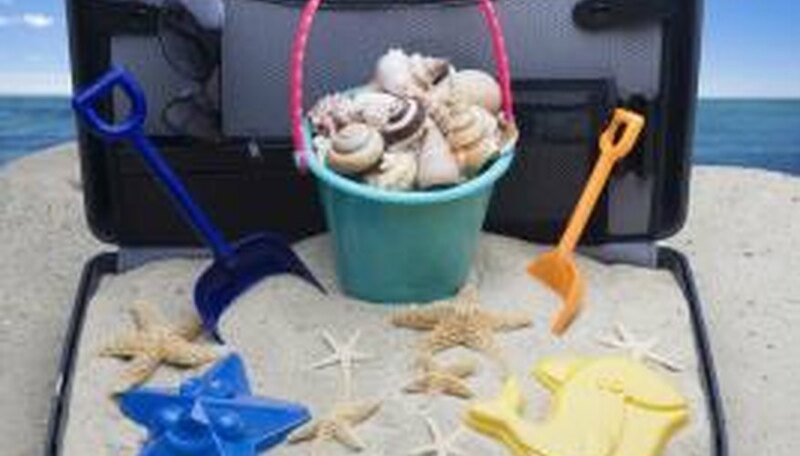 Although most sandboxes are in the full sunlight, slight shade might make it more enjoyable during the heat of the summer. Use an area where the wind will not hit the sandbox. Trace around the outside of the pool with a spray paint or even a garden hose. Shovel out the dirt the depth of the pool plus a couple of inches. The lip of the pool needs to be level with the ground so children do not trip over it, causing the plastic rim to break. Add 1 inch of sand to the bottom of the excavated area. This saves the plastic pool from cracking against a rock or hard ground. Level it over the area with the back of a garden rake. Drill several 1/2-inch holes through the bottom of the plastic pool with an awl or drill. Any rainwater that collects in the sandbox needs a way to drain or the sand will not dry out. Place the pool on top of the layer of sand. Fill the interior of the pool with playground sand until it is level with the ground surface.